Hey there Doodlebug fans - its Tya here with you today and I am so excited to share with you my project featuring the new Daily Doodles line. These calendar pages are so fun and so versatile as you have seen from the other projects my Design Team friends have shown you so far this week. For my project I decided to do a birthday reminder calendar page. Now in my family, birthday's are a big deal. Since both sides of my family live close we get to party a lot and there are a lot of family members to celebrate! 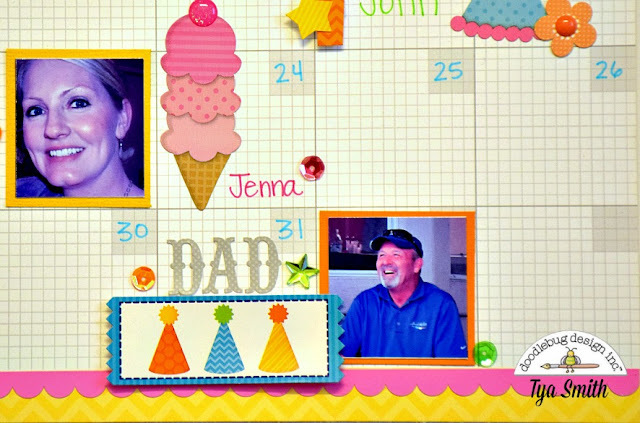 What better way to keep track of who's birthday it is than to keep track of it on a customized calendar page. and Hip Hip Hooray lines. Between the two lines I was able to get some really fun items on my calendar. I added a few sprinkles of sequins here and there on the calendar to make it feel more festive. 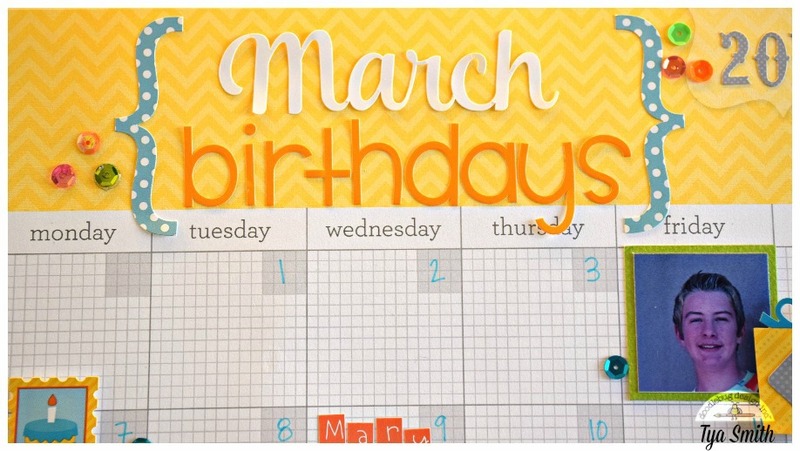 I used some Simply Sweet letter stickers along with the Months cardstock stickers. 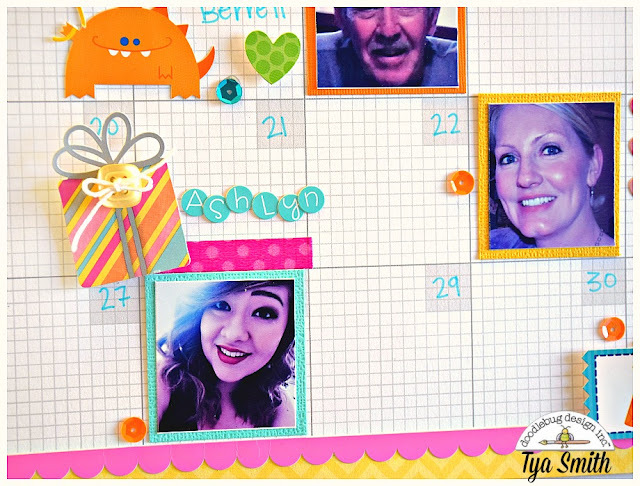 It's so fun to add photos of the birthday person in the squares next to their birthday. I printed out my photos to be about 1 1/2 inches square and mounted them on some textured cardstock. I wrote in some of the names and I also used some Teensy Type stickers and some Grey Love Letter stickers to spell out the names and the date. They are the perfect size to fit in the squares of the calendar. I also added some glitter sprinkles, regular sprinkles, rhinestones and stars for some extra dimension and bling! That's all there is to it! I hope I have inspired you today to go pick up a whole years worth of these awesome calendar pages. These would make a great Christmas gift to give grandparents! Thanks for stopping by today! Happy Crafting! This is just fabulous Tya!! Super fun project! I love how you incorporated the pictures into your calendar! We have a ton of March birthdays too, I think it would be so fun to make something like this! Such a great idea Tya! I'm going to make one of these for sure!!! 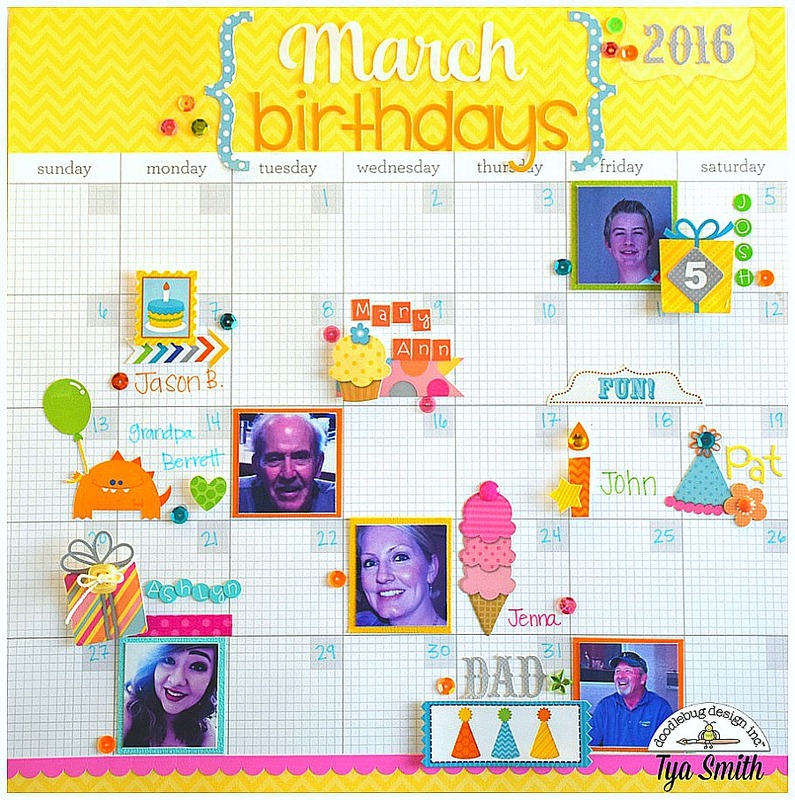 So, so very FUN and such a cute and special way to have a reminder of loved ones birthdays - so AWESOME!!! Love it, Tya!!! !